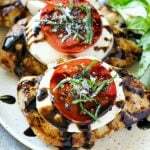 This recipe for chicken caprese is grilled seasoned chicken, topped with fresh mozzarella, ripe tomatoes, basil and balsamic reduction. A quick and easy dinner that’s easy enough for a busy weeknight but special enough to serve to company! I love easy chicken dishes, in the summer I rotate between Greek lemon chicken, bruschetta chicken and this fresh and delicious caprese chicken. One of my favorite parts of summer is the tomatoes. We’ve had zero luck with growing tomatoes at this house, so I buy the best I can find at the farmer’s market and savor them. 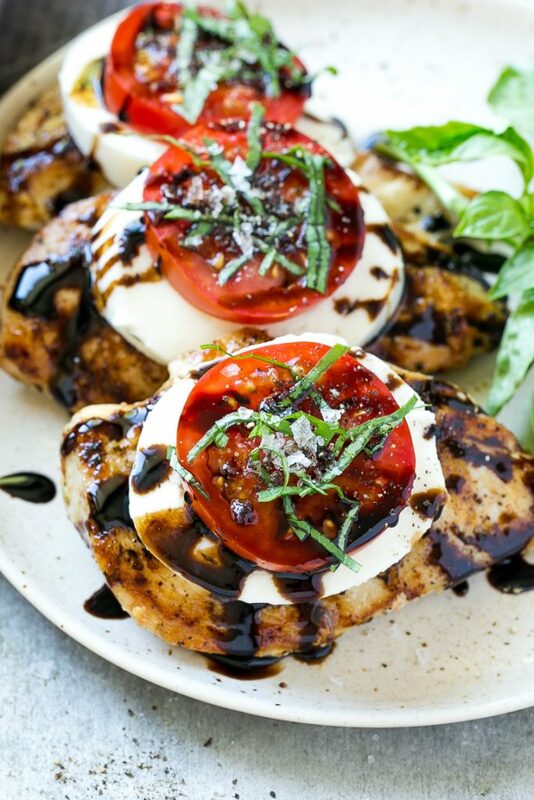 This chicken caprese just screams summer – grilled chicken, fresh mozzarella, summer’s finest tomatoes, basil and balsamic – what’s not to love? How do you make chicken caprese? This chicken caprese recipe is pretty straightforward, and the ingredients are fairly basic. The chicken is seasoned with olive oil, salt and pepper, and Italian seasoning. The Italian seasoning blend I buy is a mix of salt, garlic powder and dried basil, thyme and oregano. If you can’t find Italian seasoning or don’t want to buy it, just use equal parts of garlic powder, dried basil and dried oregano instead. Also – no grill or don’t feel like heating one up? Use a grill pan indoors instead, it’ll still be delicious! 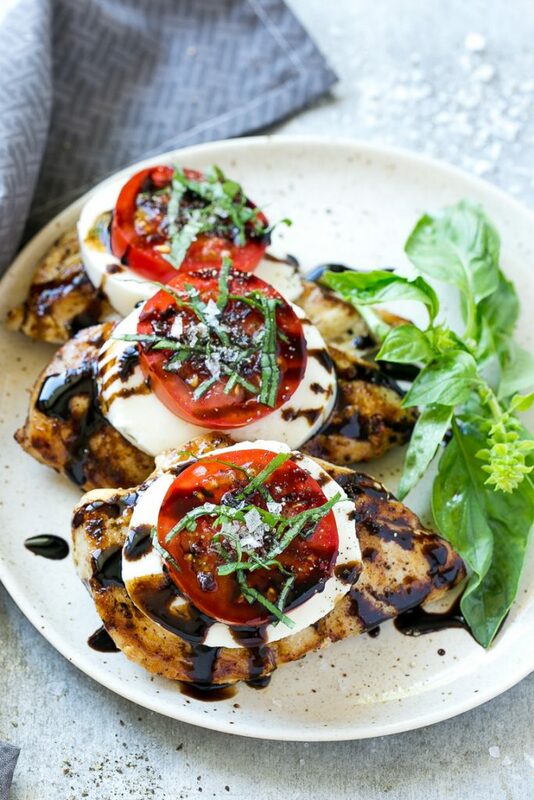 This caprese chicken is topped with a balsamic glaze, which is very different than regular old balsamic vinegar. Balsamic glaze is the vinegar that’s been cooked down to create a thick, syrupy liquid that’s more mellow than standard balsamic vinegar. I buy mine in the vinegar/salad dressing aisle. If you can’t find it at your store, it’s pretty easy to make it yourself. Use chicken breasts that are all the same size and thickness so that they cook at the same rate. I often buy the thin cut chicken breasts because they cook so much faster. Tomatoes not in season? Try making this dish with a topping of oil packed whole sun dried tomatoes instead of fresh tomatoes. I like to finish off my caprese chicken with a sprinkling of flaky sea salt, it really accentuates the flavor of the tomatoes. This chicken caprese is destined to become your favorite summertime dinner. I’ve made it countless times this month, it’s such a fun twist on the classic caprese salad. And besides, we’ve got to use up all the ripe tomatoes while they’re still in season! 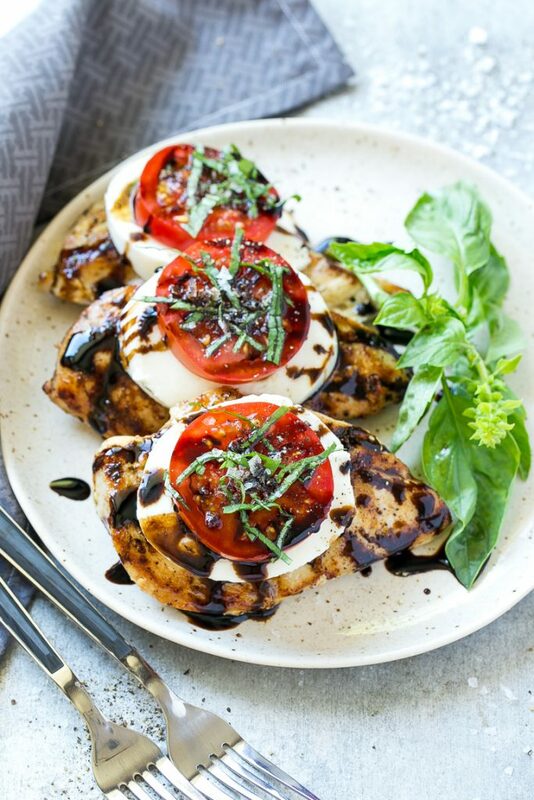 This recipe for chicken caprese is grilled seasoned chicken, topped with fresh mozzarella, ripe tomatoes, basil and balsamic reduction. A quick and easy dinner that's easy enough for a busy weeknight but special enough to serve to company! Drizzle 1 tablespoon of olive oil over chicken breasts and season to taste with salt and pepper. Sprinkle italian seasoning over the chicken. Place the chicken on the grill and cook for 3-5 minutes per side, or until done. Cook time will vary depending on the thickness of your chicken breasts. When chicken is done top with a slice of mozzarella cheese and cook for 1 more minute. Remove from heat and place chicken breasts on a plate. Top each breast with 1 slice of tomato, thinly sliced basil and salt and pepper to taste. Drizzle with balsamic glaze and serve. Very tasty sounds delicious, and looks even better Thank You, for such useful information. 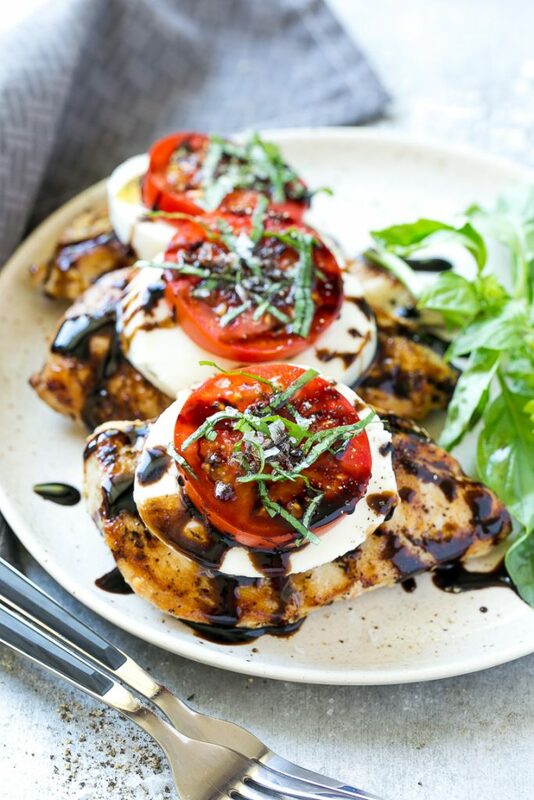 I think it is my all-new favourite.This chicken caprese just screams summer – grilled chicken, fresh mozzarella, summer’s finest tomatoes, basil and balsamic recipe was simple and delicious!My taste buds love this.Life changer! How nice easy and tasty This chicken caprese was too yummy? Just made this, so easy and delicious. I am always looking for new easy and fast chicken recipes because my family always eats chicken, even my picky children! Thanks for the recipe, I will definitely be adding this to my favorites! Just made this and it was AMAZING!! Thank you! This looks amazing and is on my list. Thank you. Love this chicken dish with fresh tomatoes and basil! I love the cheese on top! This dish looks amazing! I can’t wait to make it! I love those flavors. What a great summer meal with ripe tomatoes. Balsamic must be perfect on this grilled chicken, especially with the fresh tomato and soft cheese – a wonderful dinner and I love how simple it is to make but looks so elegant! Fast, healthy, easy and taste amazing! Whole family loves it! It’s been requested by the kids on the weekly menu for dinners!! !